For years, sales training teaches the consultative sales approach: Salespeople become consultants. They ask questions, listen to the client and get more in-depth intel. The small percentage who use this approach are top performers with high growth rates and lasting client relationships. 87% of the content is forgotten after one week. 85% of sales training has no positive ROI. It’s not that trainees don’t want to be consultants. They love this approach because it offers better returns and makes selling easier. Also, clients prefer a consultant on their side. It’s the sales environment. They come to the office with a great deal in their pocket. The manager jumps in and asks: When will the client sign? How much profit will we make? Consultative selling cannot survive in a traditional environment. So this is the problem. Being consultants to the outside, but a traditional, numbers company on the inside doesn’t work. Also, the inside thinking has to change to: What value can we deliver for our clients? 79% of buyers say that it became easier to buy products from anyone. 78% also say that they prefer a consultant to a sales rep. In other words buyers need a good consultant/sales person on their side, that will work on their goals and add value to projects. Continue with traditional selling will turn your company into box movers without any differentiation to competitors? Alternatively, creating a consultative environment, rewarding you with lasting growth and long-term clients! Contact me, if you want more inside on how to create a consultative sales-team and a supporting ecosystem. I am here to create lasting client relationships for you and with you. 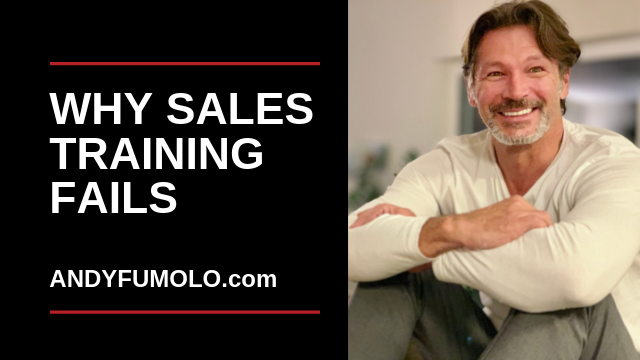 https://www.andyfumolo.com/wp-content/uploads/2019/04/sales-training-fails-andy-fumolo.png 360 640 Andy Fumolo https://www.andyfumolo.com/wp-content/uploads/2018/07/Andy-Fumolo-Logo-1.png Andy Fumolo2019-04-09 16:24:312019-04-09 16:54:00Sales Training Fails! Why?